To embrace such an approach fully, a new form of bibliographical study has to be developed: biblio-alterity is the term that will be used here to characterize this broader conceptual framework, though ethnobibliography might be a better rubric for its practices. The premise of biblio-alterity is that while bibliography was established on the basis of western cultural book practices, its analytic and descriptive methods need to be rethought to serve a broader range of types and modes of communication.2 Discussion of these issues were fostered by scholars of non-Western writing systems, particularly, those of Mesoamerica and the New World, whose work could not be accommodated by traditional book-based approaches. Keeping some connection to bibliography emphasizes the continuity of these methods as well as their differences. All theoretical models of the history of the book developed to this point have taken the codex as a given, even as they have modified their approach to its study. But before outlining the tenets of a new approach, it behooves us to revisit the major paradigms for study of the history of the book, and consider their principles and value for forging an innovative paradigm ahead. After all, much historical study has been built on these models. A few points of clarification are also in order at the outset. The “history of the book,” bibliography, and textual editing are related fields. The first tracks the development of writing, publishing, and communicative instruments in material form across a long-view of historical development. Bibliography, by contrast, is primarily a method of description and analysis of physical objects through forensic methods in the service of humanities scholarship including, but certainly not limited to, the history of the book. Textual editing focuses on establishing authoritative versions of works and texts. It takes into account the lifecycles of production—including authorship, publishing, and versioning over time. Though it might seem obvious that the study of books and their history is tied to the critical engagement with texts, in fact, that is not always the case. 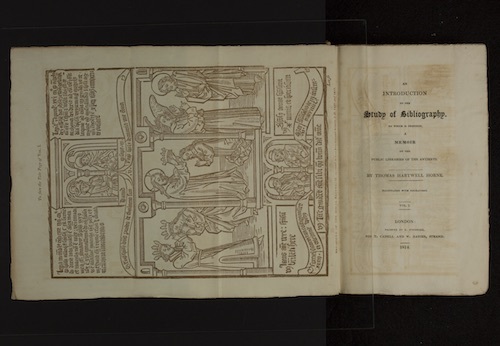 Many a bibliographer has toiled long and hard on deciphering collation formulas (the schemes for binding assembly encoded in the printing process), bindings, or watermarks without bothering to read the book whose history they are studying. The careful analysis of versions of texts, manuscripts, variations, and other corruptions or interventions is the work of the textual editor, not the bibliographer. Scholarly communities, particularly those engaged in the authentication of sacred texts have practiced critical editing and studies for millennia. Interpretative glosses on the Old Testament play such a large role in the Jewish tradition they constitute an entire work, The Talmud. The daunting task of establishing an authoritative biblical text was taken up by Jewish and Christian scholars in the early centuries of the Common Era, through the work of careful, word by word, comparison of all known scraps of evidence or “witnesses”.8 Scholars of classical texts took up similar methods as well as interpretative approaches throughout the middle ages and into the present. Other engagements with textual authenticity were driven by concerns about property rights and other legal matters. This approach is generally associated with diplomatics and the work of 17th-century French Benedictine monk Jean Mabillon. He was concerned with ways to authenticate documents, rather than texts, through the study of handwriting, scripts, and other features—as well as language. Mabillon’s work arose from disputes over church property and ownership, rather than textual transmission. His 1681 De Re Diplomatica is a masterpiece of facsimile copying and critical editing, but its purpose was to provide techniques of authentification of documentary evidence. Diplomatics is crucial to the history of archival studies and professional practices that engage with documents. Its techniques have their own development, but, like bibliographical and editing practices, these remain relevant even as they are constantly reinvigorated with new dimensions and critical insights. But though the fields of archival studies, bibliography, and critical editing have been influenced by cultural studies and theoretical paradigms arising from post-structuralism, the history of the book as a field has only begun to question its methods—and their assumptions in what constitutes their proper object of study. "Histories of the book” usually map the development of writing, early codes for recording speech or language acts, and the sequence of technologies from sticks to clay to brushes, papyrus, leather, vellum, parchment, paper, and print (and recently, electronic formats and digital files). From wall and monument to tablet and scroll to codex and screen, the technological developments march along and with them a well-marked history of milestones in publication methods, major figures, important works, and shifts in the controls over intellectual property, production means, and distribution networks. The standard narratives are histories of publishing, particularly within national boundaries, and “the book in France” or “printing in England” essays track the development of audiences, publishers, licensing and state controls, censorship, and other institutional practices and social conditions. We know the names of the major figures in print history from Gutenberg to the present, and observe the trajectory from printer-scholar to publisher into the present day international mega-corporate conglomerations. The narrative version of the “history of” has been complemented by a statistical, sociological methodology associated with the French Annales school, particularly for the earlier periods before and after the invention of printing. Not content with the description of physical artifacts, knowledge of their makers, or conditions of production, the Annales historians added considerable breadth by extending the field to considerations of commerce, politics, economics, and other aspects of book history that would not be immediately extractable from the object, but required analysis of account books, documents and records, and other historical materials. The very act of periodization, such as that performed by Roger Chartier in his attention to the “break” between scroll and codex, manuscript and print, for all its benefits and virtues, reinforces certain assumptions that are readily undone when points of continuity, rather than over-determined notions of difference, are brought into play. Book history, then, is the explicit narrative discussion of the origins and development of the book (broadly considered), that emerges from the combined traditions sketched above: the study of classical and biblical texts and their transmission, the enumeration and description of books and collections, the analysis of the physical object and its production history, and, more recently, engagement with the book as a cultural object whose meaning and value depend upon its use. But as the study that identifies itself as “the history of the book” took shape as an academic field, models of what its approach should be also came into focus. Self-critical reflection on the field was a relatively recent development, and three main models have succeeded each other, each adding new dimensions to the conversation, but leaving much room for new work ahead. In 1986, Nicholas Barker and Thomas Adams proposed “A New Model for the Study of the Book,” and though it also drew on annales approaches, it stressed that the lifecycle of a book should be understood in terms of events, not people. This shift suggested that “publication” was a process, rather than the singular action of an individual, and should include the work of the author, publisher, editor, and other players. The five events in their model of the life of a book were publishing, manufacturing, distributing, reception, and survival. The authors were implicitly criticizing Darnton’s emphasis on people rather than books in his communication circuit. Barker and Adams placed their book events within a larger frame they called the “whole socio-economic continuum,” with its realms of intellectual, political, commercial, and social/ behaviorial influences. Like Darnton, they extend the boundaries of the “book” to include other printed and written matter—posing the question of how “book history” could legitimately exclude the Declaration of Independence and other non-codex objects of significance. In spite of their many differences, these three models share some fundamental assumptions. They all work mainly within the realm of printed books and editions, or other manuscript and printed matter that is part of a continuous chain of transmission. They are all grounded in western cultural paradigms and the assumption of literacy as a mainly (if qualified) progressive process. And they are all dependent on the physical object at the center of their model, even if they are sometimes more focused on publishing than books. Recent attempts at shifting away from these foundations and their framing assumptions draw on post-colonial and post-structural theories and the work of anthropologists, cultural historians, literary theories, and others concerned with rethinking our understanding of communications and media—and producing an alternative approach to bibliography. Walter Mignolo’s Darker Side of the Renaissance, published in 1996, deconstructed the standard approaches to the narratives of European colonial expeditions and the cultures with which they came into contact. Mignolo, describing the cultural politics of encounter between the Mayans and the Spanish, begins with the asymmetry present from initial contact. The 16th-century Jesuit José de Acosta “ranked writing systems according to their proximity to the alphabet”, in spite of the recognition that the indigenous people had a highly developed literate culture.13 This included creating a vocabulary filled with colonial assumptions to designate Incan men of letters, “quipu camoyan,” scribes, “tlacuilo,” and surfaces for painted narratives “amoxtli.”14 Mignolo insists that we move beyond this kind of cultural relativism, particularly the sort based on comparative approaches privileging old world norms and conventions as standards on which terms of comparison are established. With rare exceptions, Mayan literacy has always been conceived from the European perspective. Among the exceptions was the aforementioned Acosta who observed that “in every bundle of these [quipu], as many greater and lesser knots and tied string” …encode “as many differences as we have.”15 Acosta recognized difference as the basis of signs. But his recognition of the fundamental non-equivalence of these semiotic systems was equally striking. He knew that the bibliographic practices based in alphabetic literacy were inadequate for addressing literacy conceived in a fundamentally different mode. Each of these sign systems may be as complicated as the other, but they cannot be put into a relation of reciprocity. In Nahutl, emphasis is placed on the connection between spoken words and an agent, Mignolo continues, and the Mexicans “had a set of concepts to outline their semiotic interactions.”16 If their “Sages of the Word,” were resident in the “amoxtli” or surfaces, learning was located in the body of elders, transmitted orally. The Christian philosophy of the word, conceived in connections between the archetypal book (of God) and the metagraphic book (of communication), was embedded in the Franciscan view of writing and book. Mignolo makes clear that this distinction doesn’t transfer to Nahuatl practices. More striking is that the 16th-century Acosta had insight into these issues. Other asymmetries and cultural obstacles to equivalence have been recognized for decades. But the implications of these contact moments of the 16th and 17th century are still present at the deeper level: in the still unarticulated recognition of the basic differences in the ways different cultural semiotic systems emerge, organize the cultural world, and then pass themselves off as natural, erasing the process by which semiotic conception occurs. In other words, Mignolo’s argument is not that we need better “translations” across sign systems, but that we need a way to understand difference and specificity at the level of original semiosis—in attending to the emergence and structuring effects of the formation of sign systems. The ways signs and literacy are thought, conceived, and acted are distinct in these contact zones, and the bibliographic requirements for this alternative ecology of signs can’t be developed—or taught, or turned into a critical or pedagogical method—as a simple appendix or corrective. Mignolo also discussed later developments in the 17th- and 18th-century exchanges and the philosophical foundations of their attitudes towards signs, writing, and history. Various cross currents of belief in the “universal history” of humankind were at odds with the contact experience and exchanges. Boturini Benaducci, the 18th-century ethnographer, for example, in his study of quipu, undercut the alphabet as the sole authority for the historical record.17 The lesson taken from these discussions is the impossibility of translation. Mignolo emphasized the paramount importance of attending to the description and discourse that arise around the objects, as well as the objects–because the objects are constructed by these discourses of inquiry and scholarly attention precisely in so far as they align with the conceptual principles on which the discourse itself operates. Difference cannot, in that sense, be translated, nor the problem of cultural specificity addressed through comparative methods. Mignolo’s work has been crucial to restructuring the view of Mesoamerican writing practices, seeing the glyphs and signs of Aztec, Olmec, and Mayan cultures on terms that are not comparative. Letting go of “progressive” versions of cultural development in which literacy moves from oral to written to print and then other communications media is a crucial tenet of this approach. Robert Fraser’s Book Through Postcolonial Eyes (2008) opens with a case study of printing in India that leapfrogged from oral to print, upending the fallacy of a single progressive model. 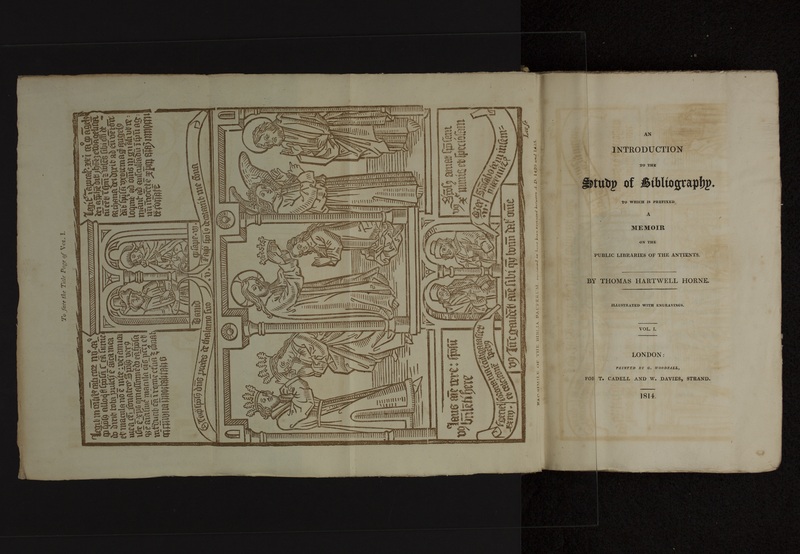 The above mentioned work by Hugh Amory, The Trout and the Milk, suggested that our understandings of the uses of print objects had to be radically qualified in cross-cultural contexts as the foundation of an alternative bibliography. Recent studies by Matt Cohen and others looking at pre-contact communication systems in the New World make the case that networks of signs made use of landscape, location, and local knowledge as part of their meaning in ways that books and print objects could not. The differences in cultural practices of legible communication are only beginning to be explored and long-standing biases put aside. The future history of the book and literacy technologies will depend upon development of a substantive theory of biblio-alterity in which specific cultural practices inform new models of description and analysis. This future approach should draw on: 1) the forensic techniques (attention to physicality, trace, materials) of traditional bibliography; 2) aesthetic analyses (forms, format, images, organization, presentation, and style); 3) study of political impacts (agency of texts and objects within power structures and forces); 4) engagement with social values (priorities, hierarchies, stratifications of groups and classes); 5) discussion of cultural pratices (beliefs, mores, knowledge, etc.) that have been part of our longer study of legible artifacts. But is should also be premised on a systems approach in which distributed nodes of production are considered as part of the processual conditions of identity and influence—contingent upon time, place, location, cultural contexts and other constituting factors. As noted at the outset, the point of developing biblio-alterity is not simply to expand the kinds of objects under consideration, but to change the basic approaches that produce the objects of our study. Figure 1. 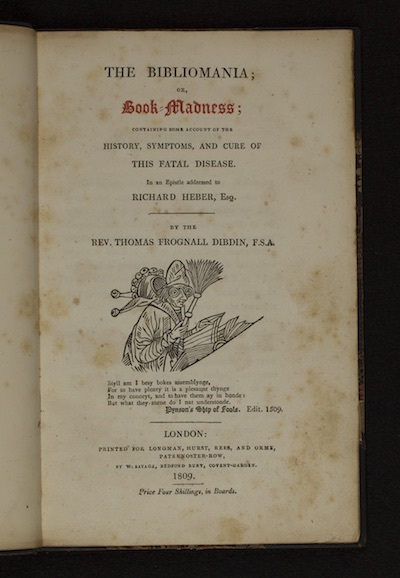 Thomas Frognall Dibdin, The Bibliomania, or Book Madness . London, Longman, Hurst, Rees, and Orme, 1809. Figure 2. Thomas Hartwell Horne, An Introduction to the Study of Bibliography. London, T. Cadell and W. Davis, 1814.